A personalized address plaque says, "This is our home and we're proud of it." 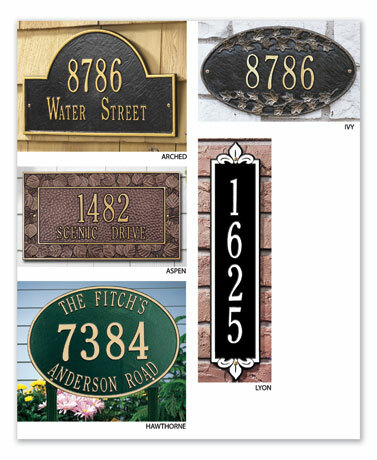 Made to last a lifetime, your plaque will feature raised numbers and/or letters on a contrasting background for maximum visibility. Hand-cast in rust-free recycled aluminum, painted with weather-resistant finishes, it comes with brass mounting screws. Available in 7 colors - Specify Pewter/Silver Letters, Black/Gold Letters, Bronze/Gold Letters, Black/White Letters, Antique Brass/Antique Brass Letters, Antique Copper/Antique Copper Letters, or Green/Gold Letters. Made in USA. Specify color code, numbers and/or letters. Allow 4 weeks for delivery. No rush delivery or gift box. Hawthorne Wall Plaque - 10 1/4"x14 1/2" - 3 Character Lines, 14-5-14 Letters/Spaces.